WHAT: Crews will be constructing grade crossing improvements on Myrtle Ave at the railroad crossing (just north of Duarte Rd) in the City of Monrovia, as part of the 11.5-mile Metro Gold Line Foothill Extension light rail project. This grade crossing work requires a full closure of Myrtle Ave at the railroad crossing for four months. To prepare the street for the long-term closure, the intersection of Myrtle Ave and Duarte Rd will be closed nightly on Saturday, January 18 and Sunday, January 19, from 8 p.m. to 6 a.m. On Monday morning, Duarte Rd will re-open to thru-traffic; while Myrtle Ave will remain closed for four months at the railroad crossing (just north of Duarte Rd). – Saturday, January 18, 2014 to Sunday, January 19, 2014, nightly from 8 p.m. to 6 a.m.: Intersection of Myrtle Ave and Duarte Rd will be closed to thru-traffic. 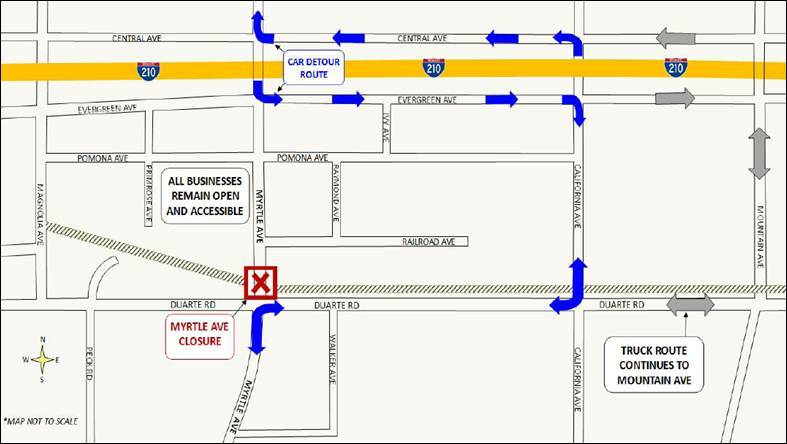 – Monday, January 20, 2014 through May 2014: Duarte Rd will re-open to thru-traffic; while Myrtle Ave will remain closed to thru-traffic at the railroading crossing (just north of Duarte Rd). · Standard construction work hours are 7 a.m. to 6 p.m., Monday to Saturday. Occasional longer hours, work on Sundays and/or night work may be performed. WHERE: Myrtle Ave at the railroading crossing (just north of Duarte Rd) in the City of Monrovia. – During the closure of the street, detour routes will be in place and signage will be posted to direct motorists and truck drivers. – Pedestrian access through the closure will be provided on one side of the street. Detour signs will be posted to direct pedestrians and bicyclists during the closure, and a crossing guard will be available for assistance during school hours. – Motorists are advised to expect delays and use alternate routes when possible. – All businesses in the area will remain open and accessible during the closure. About the Construction Authority: The Construction Authority is an independent transportation planning and construction agency created in 1998 by the California State Legislature. Its purpose is to extend the Metro Gold Line light rail line from Union Station to Montclair, along the foothills of the San Gabriel Valley. The Construction Authority built the initial segment from Union Station to Pasadena and is underway on the Gold Line Foothill Extension. The Foothill Extension is a $1.7 billion extension that will connect Pasadena to Montclair in two construction segments – Pasadena to Azusa and Azusa to Montclair. The 11.5-mile Pasadena to Azusa segment is fully funded by Measure R and will be completed in September 2015, when it will be turned over to Metro for testing and pre-revenue service. Metro will determine when the line will open for passenger service. Three design-build contracts, totaling more than $550 million, are being overseen by the Construction Authority to complete the Pasadena to Azusa segment. The Azusa to Montclair segment is environmentally cleared and is proceeding to advanced conceptual engineering in 2014.